Organic Gemstone | Positive Energy Stones | Red Coral Talisman | Japanese Red Coral. 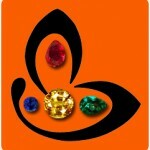 Comments Mars – It is the planet that symbolises youth, vigor, valiance, strength and courage. 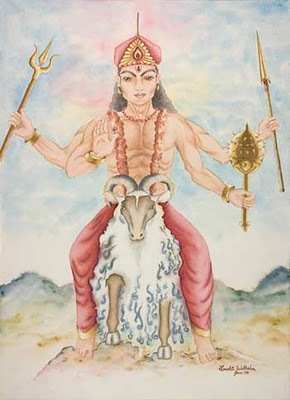 Mangal or angaraka or Kuja as he is known in the Hindu Mythology, Mars is the military chief of the Gods, one who leads the forces in a battle. 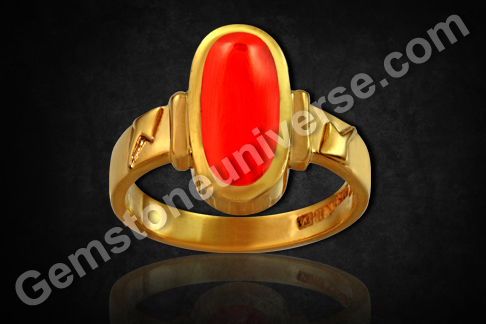 Featured today is a Mars talisman men’s Red Coral ring. A flamboyant Japanese Red Coral of 5.57 carats has been set in 22 karat gold, with the symbol of Mars standing in relief on the shanks. This full-blooded Red Coral with the rich Mediterranean Ox Blood Color is what a Jyotish quality Red coral should be like. A good weight coupled with the rich texture and natural organic origin makes it a prize piece. The red coral is believed to lend that essential spark of courage and give the individuals, confidence to take on even the tasks that have hitherto appeared daunting. It is also believed to be immensely helpful in case a person is suffering due to blood disorders. Known as pravaal / vidrum/ moonga, the red coral is a gem that has been known for its mystical abilities to ward off the evil eye and render itself as a very protective shield to the wearer and across several cultures. The increasing paucity of this gem is leading to a lot of unscrouplous traders pushing plastic and camel bone in the garb of red coral. Click here to read more on this! This organic gemstone is indeed a treasure and its value is likely to see an escaltion in its price, in the face of demand. Treasure yours, if you have a real natural organic one!